Hey there! I hope that last week was a good one for you. 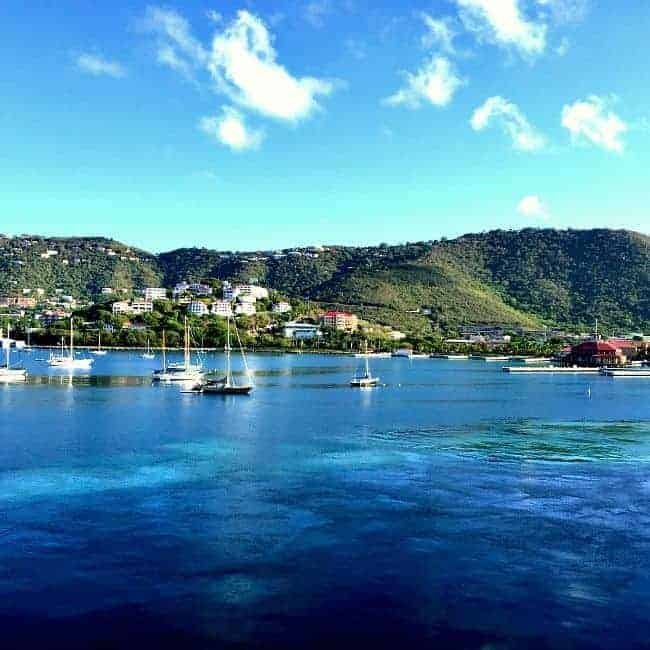 We are back from our busy but fun-filled 7 day cruise to the Southern Caribbean and I’m slowly getting back in the swing of things. I won’t lie, it was tough walking back into the construction mess and facing the unfinished kitchen. The good thing though, is that the week away gave us a chance to recharge. Now we are ready to move on to the last phase of this kitchen reno. First project on the list is the installation of the new kitchen sink. In my last post, I shared our new granite countertops and the process we went through to install them ourselves. This week is all about the kitchen sink. We had a two-bowl, shallow, stainless steel sink that I despised so I was thrilled that we were able to replace it. I know that stainless is all the rage, but it’s not really my first choice for a sink or appliances. Unfortunately our appliances were brand new when we bought the house so there was no sense in buying new. I bucked the trend when it came time to get a new sink though and went with a white farmhouse beauty from IKEA. The reasons why we went with this sink? Cost and size. 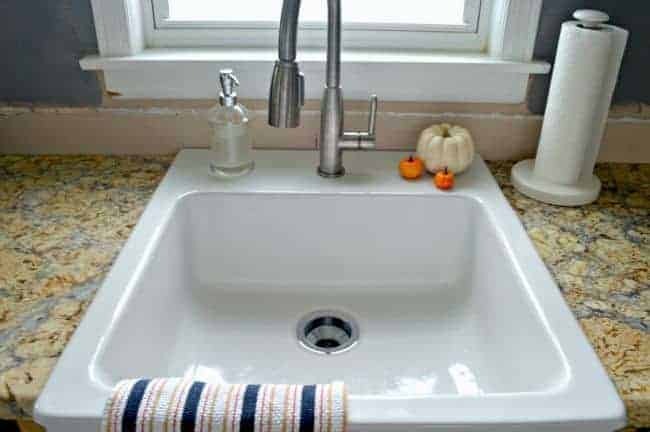 This whole kitchen reno is about staying as low-budget as possible and this sink hit the mark at $185. If you’ve ever priced out sinks you know they can be expensive. 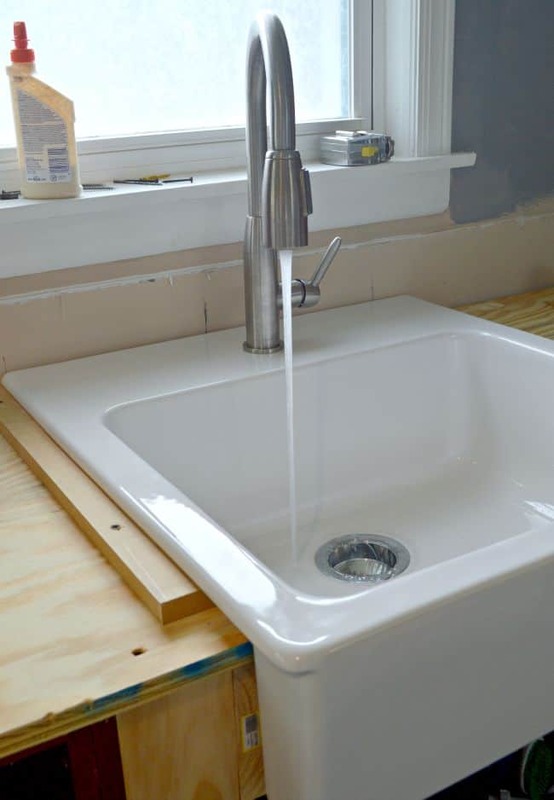 The second reason why we chose this sink was because it was the perfect size to fit in a small and tight space. Since we cut and installed our granite countertops ourselves, we needed a sink that fit all the way to the wall so we didn’t have to make any fancy cuts (that could possibly ruin the granite). We just made a straight cut on one side of each granite piece so that they fit in snug against the sink. 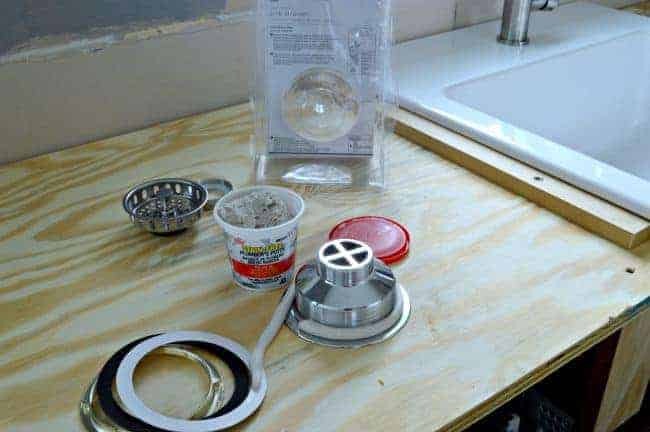 We still need to caulk the space between the sink and the granite, but you can see the nice fit between the granite and the sink. The install of the sink was actually pretty easy. We did have to buy a drain, because it didn’t come with one but, with a little bit of plumber’s putty, it was in and ready to be hooked up. Instead of buying new, we installed the old faucet from the stainless steel sink. I’m not sure if I like the way it works with this sink so we may end up replacing it, but it’s ok for the time being. I love our new sink. I’m able to fill my tall vases and large pots with ease, and there are no more ugly water spots to wipe up. For us this was a perfect choice. 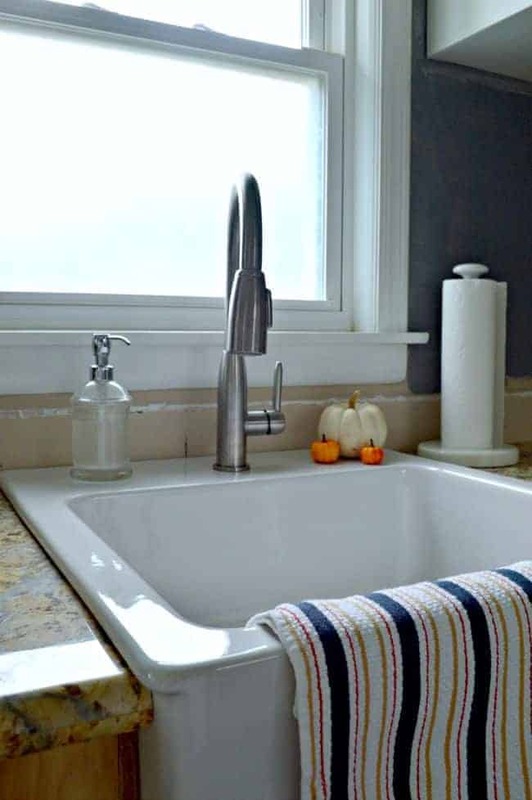 How do you feel about stainless steel sinks and appliances? Would you trade them in if you could or do you love everything about them? 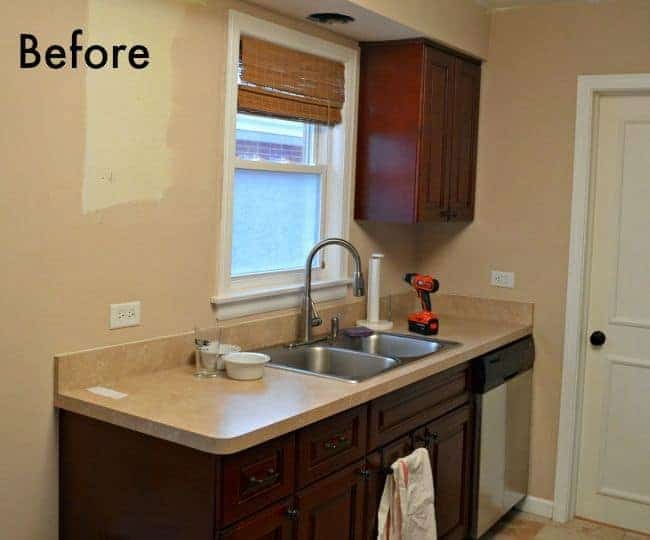 How did you retrofit the cabinets to get the sink to fit? Hi Caitlin. We only had a small space to fit a sink, and didn’t want to cut down any cabinets, so it had to be a specific size. The IKEA sink was the only one that fit. To get it in, we took the apron off and, once the sink was in, cut a piece of wood to fit where the original apron was. We couldn’t use the original apron because it was too thick. Hope that helped. Not sure if you’ll see this after all this time, but anyway…. I’ll be installing one of these sinks some time this year, so how you retrofitted it is very relevant to me. 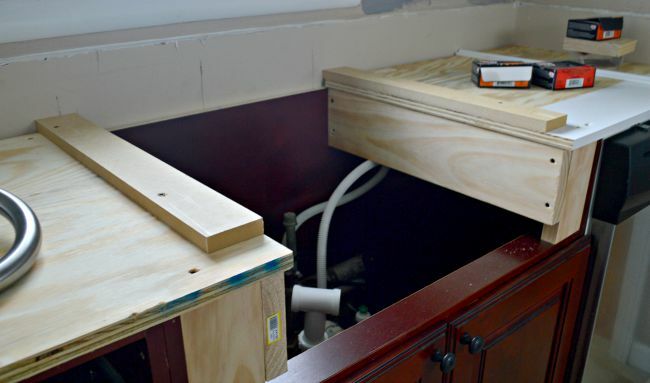 In the photos above, you have the ply base, plus the strips of timber under the side edges of the sink. Am I right assuming they are temporary, just occupying the thickness you’d require for the granite top? When you installed the granite, you removed those strips of wood? Otherwise, please can you tell me what purpose they have, and how you managed to get the granite to fit under the side edges? I’m sure it’s one of those things which is easier to do once you’re actually doing it. I won’t be installing my own (stone) bench tops, so need to understand how to co-ordinate the various installers, etc. I just love your kitchen to bits. Every time I see it I really get such a great feeling from it. I hope I can transform my kitchen as well as you’ve done yours. Thanks Kristi. Happy and thankful for any help. Love your new sink! Everything is coming together beautifully! Great choice!!!!! Love the change in this area already! Thanks Vel! We’re getting there…slowly but surely. 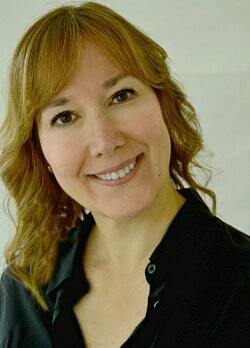 So good to hear from someone who has one, thanks Nancy! I really liked the 2 bowl sink but we needed a very specific size and it was just too large. I feel like mine is huge so I can’t image how your’s must feel. I bet it’s nice washing dishes in your sink and looking at your beautiful garden window. 🙂 I had white appliances in our home in Florida and loved them. It would be great to have them again. Maybe one day. Your new sink and counters look great, Kristi. I know you’re going to be thrilled when you’re done. Ha, I don’t blame you one bit Rue. I don’t usually mind cleaning but I hated keeping that sink clean. I will be so happy when this is over. I enjoy the projects but the construction mess is tough to handle. Soon, very soon. I’m so ready to share the full reveal Debbie. We are getting there, slowly but surely. 😉 Thanks for always stopping in and cheering me on through this long process. Hope you have a great week! I have a stainless steel sink and yes, I hate the water spots, but I hate the chips that the porcelain sinks can get even more. When I clean and shine my sink up I love it! And I am very diligent about keeping it clean and shiny . . . when I’m home, unfortunately I work full-time and I don’t know what goes on in my house when I’m not there! Oh well, you have to get what you like, not what the trend is or what everyone else is doing, so if you love it that’s all that matters. So far of what I’ve seen it looks great, Kristy! Looking forward to that final unveil! Water spots in a ss sink are the worst but they do look great when they are kept clean and shiny. Unfortunately, that was never possible in my house, with my messy husband and my lack of attention toward it. I do admit that when you have all ss appliances, a ss sink is definitely the best match, but, this time, I went with what I wanted and not what would look best. Hey, we all have different tastes and that’s why we have so many choices, right? I am so ready to be done so I can share a complete reveal with no patched walls and unpainted wood. I’m grateful that you have stuck with me during this very long process and I thank you for always coming back and commenting. Your support has meant so much to me. Hope you have a great week my friend. Thanks so much for visiting Jessica and I hope you have a great week! I agree totally concerning the stainless steel appliances and sinks, they look so industrial and never clean, I have all black appliances and love them. Oh my goodness Ellen, I just can’t keep my stainless clean, and it’s only the two of us. I can’t even imagine what they would look like if we had kids at home. I’ve never had black appliances but they sound sleek and sophisticated. I bet they look awesome. Thanks so much Phyllis! I’ll be happy when I can share the whole kitchen completely finished, and minus the construction mess. Hmm. I don’t know which picture is prettier, the fabulous blue ocean or that glorious new sink. Now that’s the mark of a true decor junkie, huh?